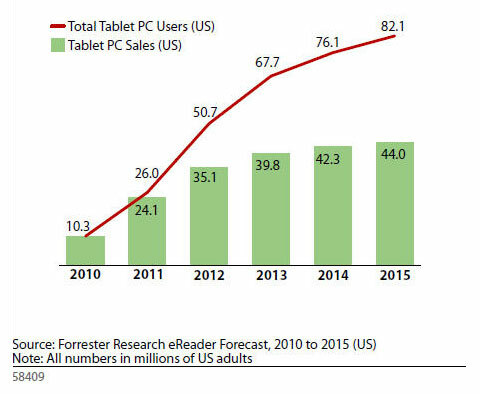 2011 – Year of the Tablet? 2010 was a great year for Apple, as the company successfully launched the iPhone 4, the fourth generation iPod touch and the second generation Apple TV, its stock reached an all-time high, and most of all, it redefined mobile computing with the launch of the iPad. According to a report from analyst Sarah Rotman Epps of Forrester Research, the company is poised to perform even better this year, as consumers throughout the world seem to have an insatiable hunger for mobile devices, and especially tablets. Between the launch of the Android 3-based tablets and the second generation iPad, 2011 should be the year of the tablet, as more than 24 million units should be sold this year in the U.S. alone, a 233% increase when compared to the sales figures for 2010. Epps expects Apple to be the big winner of the upcoming tablets war, as according to her, “of those sales, the lion’s share will be iPads, and despite many would-be competitors that will be released at CES, we see Apple commanding the vast majority of the tablet market through 2012.” Everything’s not lost for competitors Google, RIM and Microsoft though, as while Apple is expected to remain the top tablet seller this year, there is still room for more than one player: “Research In Motion’s BlackBerry PlayBook, Microsoft’s Windows-based tablets, and tablets that run on HP’s and Nokia’s platforms, they’ll take a backseat to Apple, but in a market this big, there’s room for more than one player. By 2015, 82 million US consumers — one-third of US online consumers — will be using a tablet, and not all of them will be iPads. In other words, if you thought 2010 was the year of the tablet, you were wrong. While Epps’s figures may be a bit overstated, tablets – and especially the iPad – undoubtedly managed to create a large market for themselves in a matter of months, and quickly became “lifestyle devices” instead of simple gadgets, used at home, at work, and even in school.